Camping. If you add an “r” it becomes “cramping”. After the van is packed and all six people are in their seats, buckled up, we take a moment to adjust to the new size of our personal space. Expectations are recalibrated. We pray together- not just for safety but also for the ability to be generous to each other. 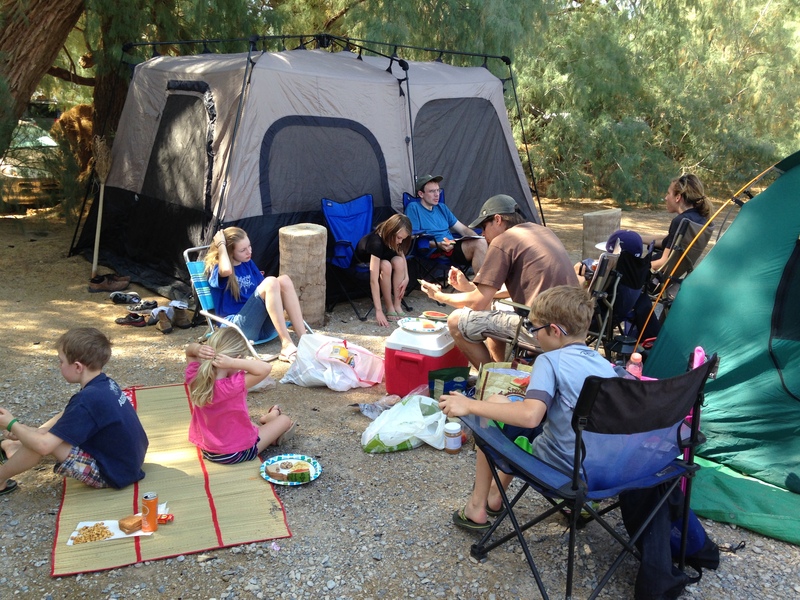 Because a good family camping trip is serious bonding time. We might feel physically cramped in the car and in the tent, but it’s always a good time. In fact, there’s nothing better than that kind of togetherness. Really, nothing. This particular trip was an opportunity to be with my sister-in-law’s family from Southern California. We decided to camp together in Death Valley. Most of us had never been there, and March seemed like the perfect time to visit because the temperatures are decent and any small thing that might be green or growing or flowering is likely to be doing so. We have a seven year old who is really interested in deserts and his enthusiasm was contagious. So, with a generous amount of water and granola bars in the car, we left the snowy Wasatch Mountains behind and headed south. We drove for about 6 hours. A quick survey in the car revealed that the kids were reading Death Valley-appropriate book titles like And Then There Were None and House of Hades. We spent the night in Las Vegas, then gathered some more needed supplies at Food-4-Less before heading west from Sin City onto a deserted road called Old Spanish Trail. It wasn’t hard at all to imagine a line of packed burros and sunburned hombres on that road. We saw 2 lone cyclists and 1 other car. There was no cell phone service. A little while after crossing an invisible state line into California, we found the dusty sign for China Ranch. This was to be our meeting place and oasis. 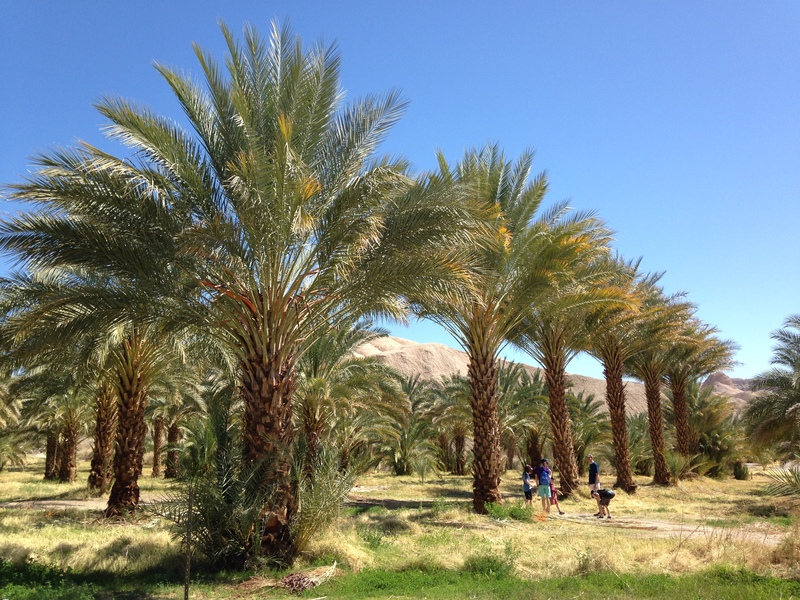 In the middle of a very desolate land, the narrow, windy road down into China Ranch suddenly revealed a fruitful haven with a spring, lots of date palms, a bakery/shake shack, and a gift/antique store. A very real oasis, indeed. 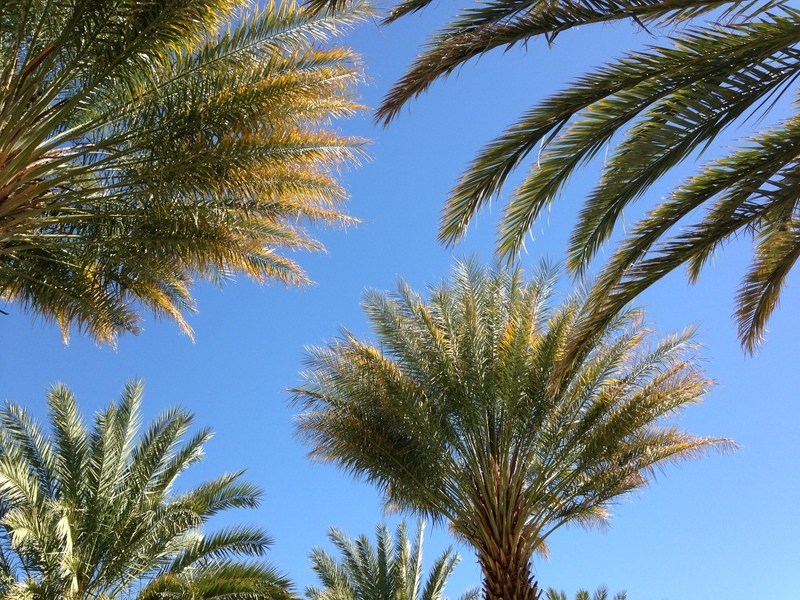 We rested, walked a little trail, played under the shade of the 120 year old palm groves, ate wonderful date bread and delicious date milkshakes, bought a few treasures, and met up with our California cousins. It was a marvelous and enchanting place. Let the fun begin! As we wound our way up and out of China Ranch, the rocky, washboard dirt road jostled us around in our seats and suddenly there was a most unusual sound. A bad car sound. We had either cracked a joint or busted a small hole in our muffler. For the remainder of the trip, we sounded like a one-van motorcycle gang everywhere we went. Very embarrassing and there was nothing we could do about it until we returned home. Well, at least it added to the adventure and we were grateful that it was nothing bad enough to kill the camping trip or require a hot and dusty (expensive) tow-truck rescue in the California desert. After Tecopa, we worked our way over to Shoshone, California. 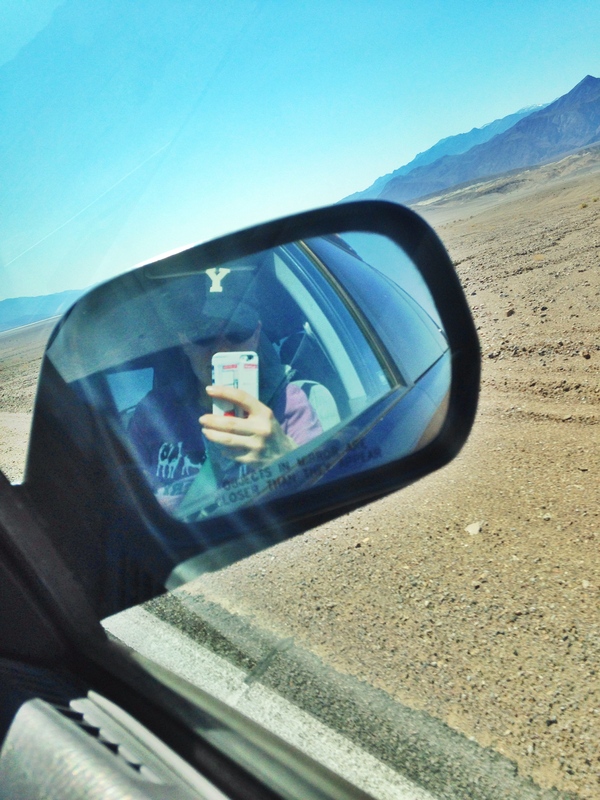 It was the last pit stop before Death Valley on our road, so we put several gallons of gas in the car. VERY EXPENSIVE gas at $5.05 for the lowest grade. However, we had heard it was even more expensive inside the National Park- which was true: $5.45. 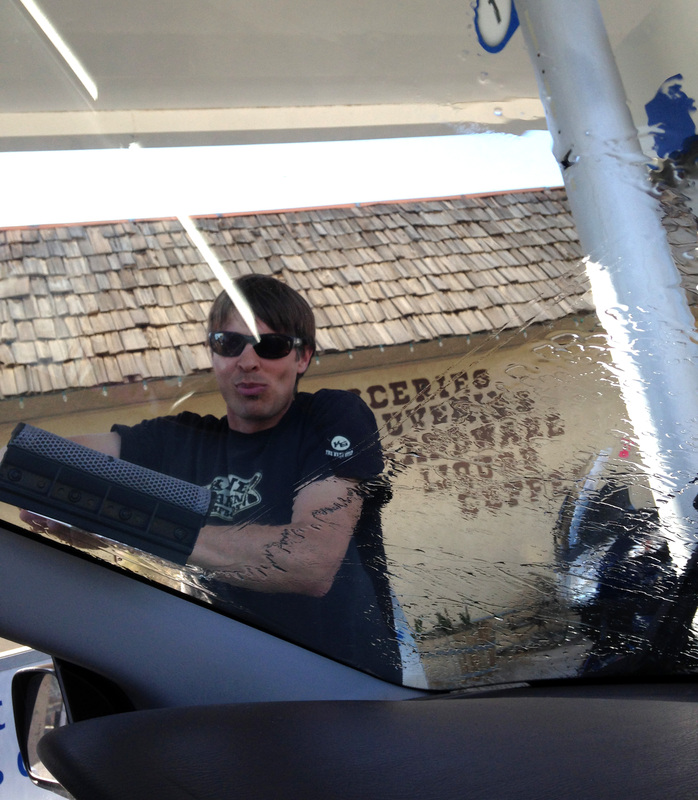 Uncle Andy thought that we deserved full service with prices like that so he washed all the windows of both vehicles. Thanks, man. We drove into the park through the south-east entrance on Highway 178 (Jubilee Pass Rd) which had lots of yellow, white, pink, and purple wildflowers along the roadside, then up through the center of the park on Badwater Rd. We stopped for pre-sunset photographs at Badwater Basin (elevation -282ft/-86meters and the lowest land elevation in North America), and the ever-so-slightly-higher Devil’s Golf Course. Badwater basin is a salt area that floods occasionally, leaving behind a flat basin. Way up on the mountain east of the basin is a sign noting the location of sea level. Wild. You can walk out on the flat and take photos and Andy found a little hole where he enjoyed being at a slightly lower elevation than the rest of us. (He’s an overachiever.) This area, like many of the popular stops within the park, has a restroom facility by the parking lot. 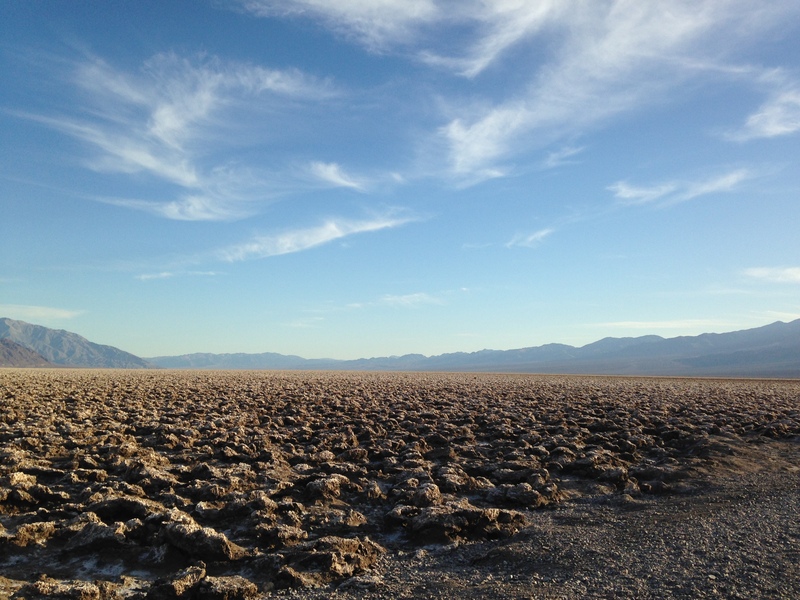 Devil’s Golf Course is a less-developed stop with a similar salty environment, but this area does not flood and so the minerals are sculpted and eroded by wind and weather, forming sharp and hard formations. Very pretty. You can also walk out on this area although caution should be exercised by wearing good shoes (not flip-flops- or else bring a lot of bandages) and by walking gently so as to not destroy the crystals. 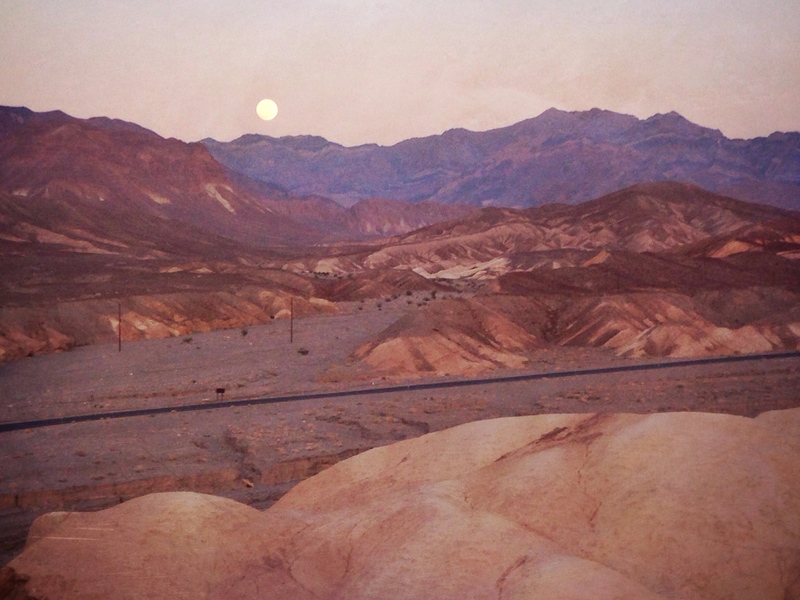 As the sun was sinking behind the Panamint Range, we began to look for campsites. We had originally made a reservation at one of the 12 campgrounds in the park but had cancelled it when it looked like the temperatures would be too high to enjoy camping. As the forecast changed, we voted for camping again but didn’t make another reservation. The spontaneous-types within the group were in charge. 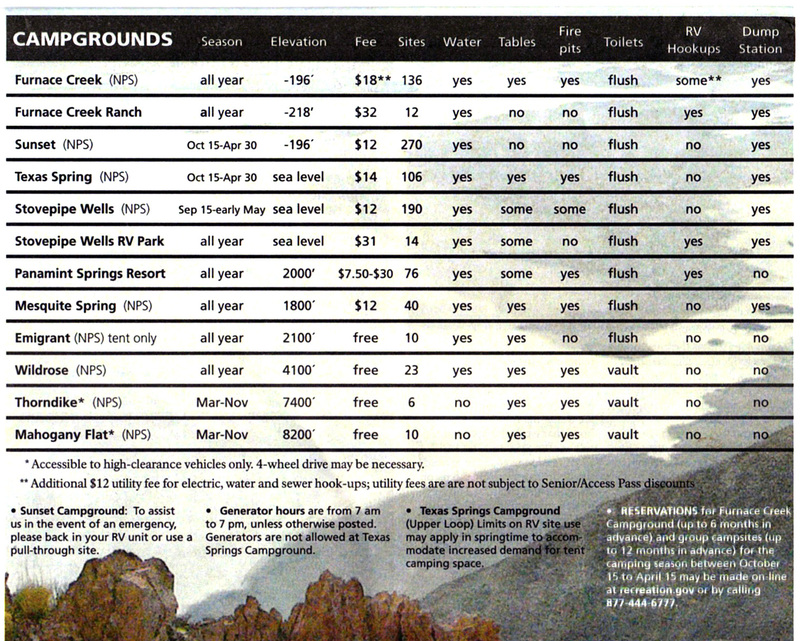 We checked out Texas Spring (a National Park Service campground) and it was fine but didn’t have two spots next to each other by that time of day. It also had no shade or showers but did have bathrooms and a communal sink for washing dishes. We were right behind the main Visitor’s Center for the park which is a nice, updated facility with a small (well-used) water bottle filling station. We stopped by in the morning and noted that the temperature was a balmy 77F/25C at 10am. 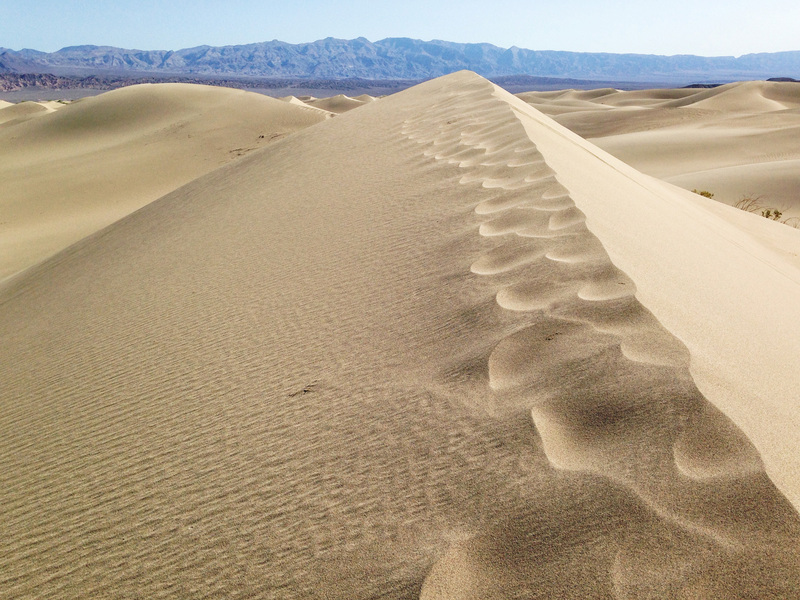 Next we headed north to the Mesquite Flat Sand Dunes, just past Devil’s Cornfield. They were beautiful dunes and the Californians brought a boogie board and wheel-less skateboard for riding down them. I headed east through the main section for some photography while the other crew of 10 headed north-east to conquer the highest dune. It was pretty far off and took them and hour and a half to go and come back. The 100spf sunblock lotion was a good idea. So was the gallon of limonada. Next up was a trip to the showers, the pool, and back to the showers. After swimming and washing, we had ice cream at the General Store. The area near the registration office and General Store does have some internet connectivity for guests of the resort. 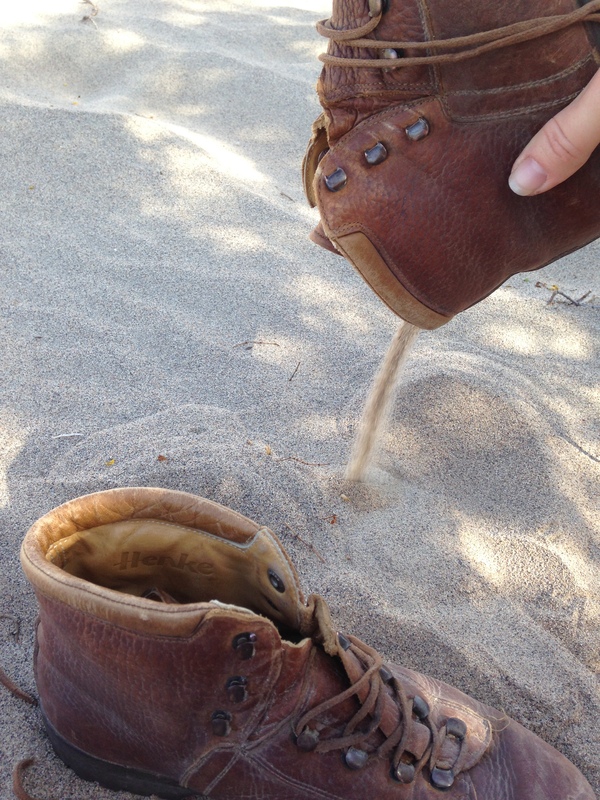 Thus the sudden flood of sandy instagram images on my account. After a stop at the Visitors Center (where it was 98F/37C), we had pizza at the Corkscrew Saloon, then headed up to Zabriskie Point to watch the simultaneous sunset and moonrise. Ooooh, aaaah. There were a lot of photographers there and it was a really beautiful evening. As it got dark, we drove through Artist’s Drive past the fading gradated colors of Artist’s Palette. It’s probably better during daylight. By that time, the moon was high and 9 of us went for a moonlight hike through Golden Canyon. I stayed behind with the sleepiest child. That night, the wind was lighter but there was a pack of coyotes who frequent the golf course next to the campground, making for another noisy and restless night. Really, I wish I was a heavy sleeper. The grounds crew evacuated the coyotes just in time for the popular 6:30 am tee time for the early-rising golfers. We had some nice conversations with our RV neighbors as we packed up our tents and they were complimentary of our combined 7 children. They had been good neighbors, too, all things considered. We visited the old Harmony Borax Works mine before separating from our extended family and making our way out of the park via Highway 190 East. We kept going east through Death Valley Junction onto State Line Road which crossed into Nevada and went past a small natural gem which is rarely visited: Ash Meadows. We hadn’t planned on seeing it and had some time constraints, so we picked up a brochure for future reference. Looks like a very nice place. We drove through Pahrump and back to Las Vegas, then home on I-15. This entry was posted in Life, Spring, Summer, Travels and tagged acitivities for kids, family, fun, life, outdoors, spring, summer, Travel by Maren. Bookmark the permalink. What a fabulous adventure! Thanks for letting us in on the fun (rhetorically).